Our Enhanced Rotating Antenna is specially designed for receiving digital over-the-air (OTA) TV broadcasts from all your local television stations. So never pay hugely expensive cable or satellite fees again and get all your local channels in crystal clear quality, absolutely free! Freely rotate 360 degree to pick up signals from any direction, so after installing the antenna, you can change its receiving direction simply by remote control, but not have to adjusting the mounting pole strenuously. Are you troubled to adjust the antenna direction on the roof for better signal reception, especially on bad weather day? Now with this tv antenna, you will never have to do it again, just stay at home comfortably to adjust the antenna direction by the remote control. The distance from the broadcast towers will vary based on the location of your home. Visit "tvfool" and enter your address or zip code for details about the towers near you. This information will assist in selecting the correct antenna model and aiming your antenna for the best results. 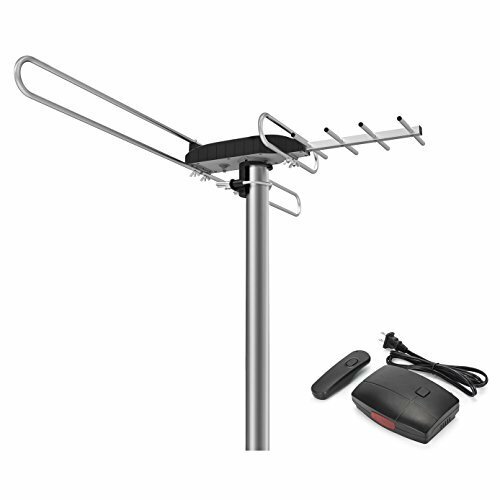 1x Rotating Antenna Main Unit with 49.2ft Coaxial Cable; 1x UHF Enhanced Reception Loop; 1x Pole Mounting Accessories; 1x Power Supply Unit; 1x Remote Control （batteries not included); 1x 5ft 3C 2V Coaxial Cable (From PSU to TV); 3x Cable Ties; Instruction Manual. If you have any questions about this product by 1byone, contact us by completing and submitting the form below. If you are looking for a specif part number, please include it with your message.